It’s been a while since my last blog post. Between helping out on a scout camp for a week, testing for Nationals and going to parties I haven’t found the time to write about my last few drafts. I will cover the last 3 drafts at my local club in Oxford and summarise what I learnt from them. This draft didn’t go so well. I opened an Overrun and with nothing else interesting in the pack I ran with it. I wheeled 3 Rampant Growths all in pack 1, so I was set up to play all the fatties and splash any removal spells I saw. 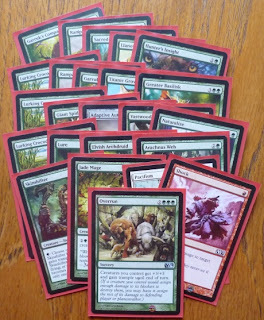 Unfortunately someone else took all of the large green creatures we opened apart from one lowly Vastwood Gorger. And to add to my misfortune the only removal I saw in the entire draft was one Shock and one Pacifism. The resulting pile kind of looked ok – I had a lot of creatures and I had my Overrun, but I was seriously lacking in the department of being able to interact with my opponent. When playing the deck I kind of just made men and felt a little helpless. Round 1 – I was stamped by Alwyn’s RB bloodthirst deck with lots of removal for my guys, which topped out with a 12/12 dragon. A sudden 7 drop was definitely a surprise out of his deck full of cheap spells. 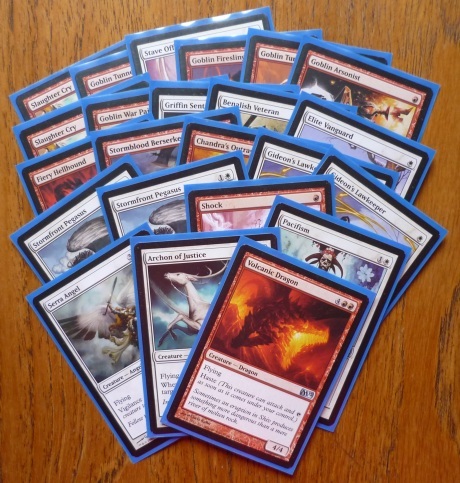 Round 2 – I played against another RB bloodthirsty deck made by Ben, he had lots of enablers and rather less removal. He won quickly in the first game, in the second game I powered out my Vastwood Gorger and beat him up with it. The third game was incredibly frustrating. I’d boarded in Circle of Flame which held him off from being able to attack me with anything, then proceeded to draw my Overrun and almost all of my lands. Eventually he cast Consume Spirit at my face twice and I died. Round 3 – I got paired with James’s BW deck. Unfortunatlely for James I found my Overrun game 1, and had my Shock ready when he tried to put Angelic Destiny on one of his small creatures in game 2, so I won the last round. 1 – 2 is definitely not where I want to be in any draft. I think my deck did have some problems and I didn’t draw very well so it was understandable after some analysis. I was very impressed by Jade Mage, it would have been sweet to have had my Adaptive Automaton set to “Saproling” at the same time. So, next week – another draft. At the end of this draft it was obvious I’d drafted too many tricks and not enough dudes. In my sideboard was a second Unsummon, 2 more Stave Off, Guardian’s Pledge and a Celestial Purge. I’d mistakenly passed up on an Armored Warhorse and a Coral Merfolk that would have made my deck much better in order to take things like Turn to Frog and Celestial Purge (Turn to Frog may work sometimes, but in my deck it turned out to be a waste of space, being quite dead against Drifting Shades and Bloodthirsted dudes – I kept on boarding in my 2nd Unsummon instead). In the end only 12 creatures can actually attack (and the Looters don’t really want to), so playing Swiftfoot Boots and Spirit Mantle was probably also a mistake. 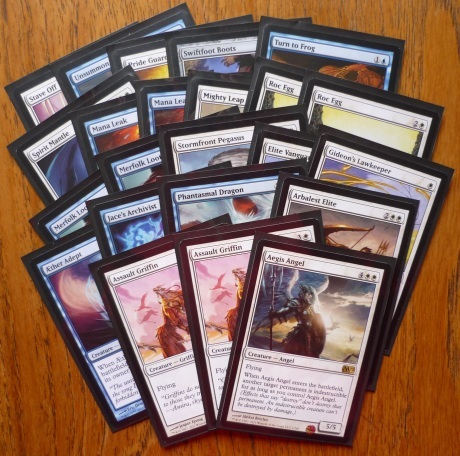 Round 1 – Anthony had drafted a UG deck this week. In game 1 I got some attacks in with some of my fliers, but he had Jade Mage out. You guessed it…. Overrun for the win to him. In game 2 Anthony mulligans, is a bit mana screwed and I get him with some attackers before he can draw out of it. In game 3 we have a stupid fight over my Looter as he bounces it and I recast it due to having nothing better to do. I have a choice to either bounce his Giant Spider and Mana Leak it on the way back down, or to do this to his Chasm Drake. I do it to the Spider then regret this decision as all of my fliers get Plummeted and Stingerfling Spidered and he kills me in the air. Round 3 – Alwyn has also drafted UG. In game 1 he plays Garruk, Primal Hunter. Oh-oh…. I manage to kill Garruk from 6 counters by Turn to Froging his Chasm Drake, Mighty Leaping my Arbalest Elite and attacking Garruk with that and my Aegis Angel. Then I die to beast tokens… In game 2 I draw my perfect curve-out agressive draw (which felt very powerful – I am sure UW aggro is a good deck if drafted properly! ), and all he does is make a Greatsword and Throne of Empires. In game 3 I get to meet his other mythic rare – Primordial Hydra. I Unsummon it when it starts to get out of hand, but he correctly reads that I have Mana Leak and refuses to replay it until he can pay the extra 3 mana. My attacks are halted by a Stingerfling Spider, and despite my Looting I fail to find one of my other bounce spells to stop the 16/16 trampling Hydra from killing me. Again a 1-2 performance, things were not going too well. It was unfortunate that there were so many mythics and Stingerfling Spiders out there to get me, but there was a fundamental problem with my deck (not enough attacking creatures) so I place the blame on myself. It might have helped if my Roc Eggs ever got broken – they either looked up helplessly at a flier beating me up, or were Pacifismed or covered in Arachnus Web. I definitely learnt not to overvalue cute tricks over solid 2 drop creatures this draft. And now we come to last Thursday’s draft deck. As you can see, this deck looked much sweeter than the last two, and I loved my deck’s removal and top end creatures. There were good blue cards also available to my seat, but I sort of forced the red as I’d already drafted WU twice and I wanted to experience some more variety in archetypes. 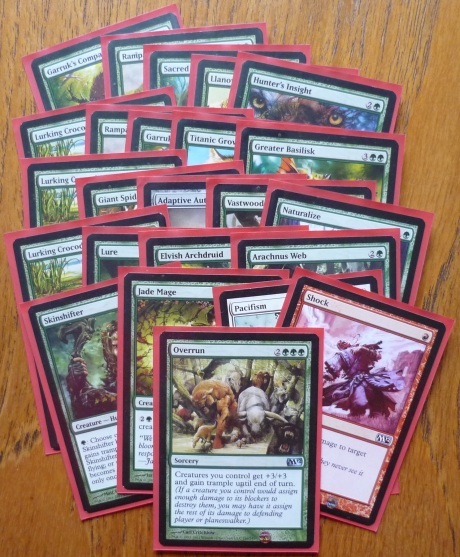 I was a little unlucky in the draft to not see more red creatures with Bloodthirst, but it was a 6 man pod so I assume we just didn’t open that many. One of my hardest picks in the draft was the one booster that did contain two Bloodthirst creatures. I agonised between the Gorehorn Minotaurs and Stormblood Berserker, eventually choosing the Berserker because I had lots of enablers and it was easier to cast, and I couldn’t think if I had enough cheap creatures at the time in my pile. I think this was a mistake though – at the end, I had loads of two drops and only 1 four drop. Even with plenty of enablers the Berserkers are very tricky to get as a 3/3 on turn 2, and the Minotaurs would have made much more of an impact on the board. Round 1 – This round was against a UR deck drafted by Niels. I’d never played him before (though I think he may have been to the prerelease), and I’d been feeding him very good blue cards in the draft – I knew he had at least 2 Aether Adepts. I’m not sure how he ended up with red as his second colour though! In game 1 he gets stuck with 2 land in play and my deck punishes him with a quick kill. In game 2 I mulligan to 6. This game was pretty cool – there was a stand-off between his Flameblast Dragon (now the red made sense!) and my Archon of Justice. Thankfully he does not have the land + Unsummon to kill me, and he has to attack into the Archon and trade in order to use his dragon’s blaze to kill my Stormfront Pegasus which is merrily flying down a goblin’s tunnel at him. I play some more men and kill him. Round 2 – Time for another game against my nemesis Rob. Rob’s drafted a BR bloodthirst deck. Game 1 was a sorry affair as he’s not that quick out of the gates but I mulligan to 6 then get stuck on 2 land for ages. I die before I can draw my 5th land for my Archon. I go to my sideboard for a little help – he is even more agressive than me and all his men are pathetically small in general and his removal is for small creatures. So I side in 2 Bonebreaker Giants and side out one Goblin Tunneler and the Goblin War Paint as I’ve seen instant speed removal from him. Game 2 goes according to plan – he gets some early damage in, but I make some blockers and hold on to my Pacifism – I’m rewarded when I get to put it on something that matters, his Sengir Vampire. He Combusts my Archon (so I get to remove one of his ground guys), and I have follow ups of Serra Angel and Bonebreaker Giant. Game 3 I mulligan to 6 again. I then make a terrible mistake by not listening to all the advice I’d read about going against your nature when playing against bloodthirst. I should have traded my better Stormfront Pegasus for his lowly 1/1 Duskhunter Bat when it attacked. The game spirals out of control as I can’t do anything about his pumped Blood Ogre. Again I would have been saved if I could have drawn a 5th land to make a big blocker, but I failed to buy myself the time by not making the Bat for Pegasus trade. 2 – 1 is good, and I learnt the hard way how important “bad blocking” is against RB bloodthirst. So that’s it for live drafts before Nationals. I hope you too may have learnt something from my mixed experiences. Wish me luck! I'm one of those mythic rare female tournament players you may have seen at a PTQ or GP. I've been drafting since the original Mirrodin block and I've played at GB Nationals every year since 2008. I work as an artist in the computer games industry and am known to occasionally paint card art for Power-9 proxies and card design competitions, make website banners and design t-shirts for my local magic group in Oxford.